Every June the city of Lowell, Massachusetts, celebrates Franco-American Day, raising the Franco-American flag and hosting events designed to commemorate French culture in the Americas. Though there are twenty million French speakers and people of French or francophone descent in North America, making them the fifth-largest ethnic group in the United States, their cultural legacy has remained nearly invisible. Events like Franco-American Day, however, attest to French ethnic permanence on the American topography. 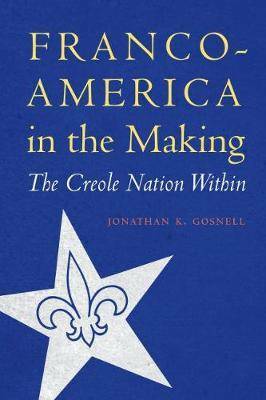 In Franco-America in the Making, Jonathan K. Gosnell examines the manifestation and persistence of hybrid Franco-American literary, musical, culinary, and media cultures in North America, especially New England and southern Louisiana. To shed light on the French cultural legacy in North America long after the formal end of the French empire in the mid-eighteenth century, Gosnell seeks out hidden French or Franco identities and sites of memory in the United States and Canada that quietly proclaim an intercontinental French presence, examining institutions of higher learning, literature, folklore, newspapers, women's organizations, and churches. This study situates Franco-American cultures within the new and evolving field of postcolonial Francophone studies by exploring the story of the peoples and ideas contributing to the evolution and articulation of a Franco-American cultural identity in the New World. Gosnell asks what it means to be French, not simply in America but of America.